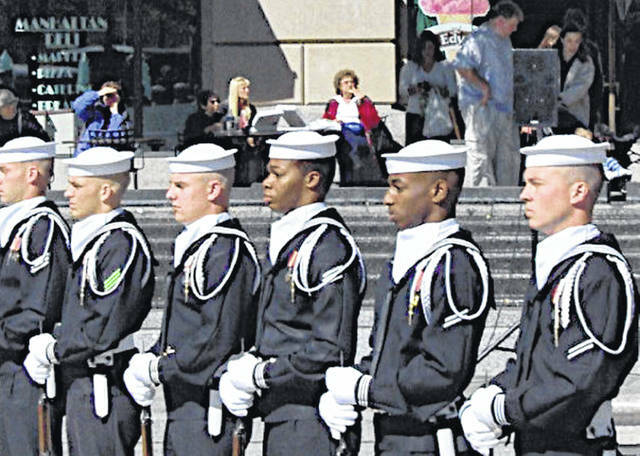 Hillsboro resident Andrew Marler, far right, is pictured as a member of the United States Navy Ceremonial Guard at the United States Navy Memorial across from The National Archives on Pennsylvania Avenue in Washington, D.C.
Editor’s Note — This article was authored by Andrew Marler, a 2003 Hillsboro High School graduate who currently resides in Hillsboro, as he reflected on the death of former President George H.W. Bush and the time he served as a casket guard during late President Gerald Ford’s funeral. President Gerald Ford had passed. I remember that night in 2006 as if it were yesterday. I was not able to go home for Christmas that year. At least one-third of the command had to stay in the capital in preparation for the rare occurrence that we would need to participate in a presidential funeral, the reason the command had been specifically created. My parents and younger brother had arrived the previous afternoon, Christmas day, so I wouldn’t be alone. We had managed to get a day and a half of sightseeing in before I would eventually call them and tell them our visit would be cut short. I would be on a C-17 bound for California by the time they would wake. I had been preparing for this moment for a year. Not just any sailor in the fleet could be called to participate in this ceremony. We spent hours each night ironing our uniforms with industrial pressers and even burned the strings from the inside and outside of our uniforms. We maintained the unique tradition of shining all the brass on our ceremonial uniforms until all the blemishes and holes were gone from the ceremonies we had performed that day at Arlington and/or the White House. We polished our ceremonial belts and medals, down to the heel brass on our shoes that would click together in perfect unison. Thousands of hours were spent marching and perfecting rifle movements with our leftover deadstock World War II-era M1 Garands with fixed bayonets. All this hard work and preparation would pay off. By the time I landed in Palm Springs, Calif., I had been given my assignment. I was to be one of the Navy representatives guarding a corner of the former president’s casket. After the memorial services at President Ford’s personal place of worship, the St. Margaret’s Episcopal Church in Palm Springs, I quietly marched in with a representative of each of the other branches to silent calls from the officer in charge . We found our position at each corner of the casket as television cameras rolled and visitors passed through, paying their respects. It was imperative that we remained perfectly still for our half-hour shift. We would pick a spot in the room to focus on so our minds and bodies would tune everything else out. Four teams would rotate over the next 24 hours until we would leave for the next stop on our trip, the Gerald Ford Presidential Library in Grand Rapids, Mich., where President Ford would be laid to rest. One of the most memorable moments I had during my period of service came after the casket bearers carried President Ford into the entrance of the library, where he would lay in repose until the funeral. During a commercial break, I was approached by members of the United States Secret Service to help assist in picking up the casket and moving it as the Lincoln catafalque — the stand upon which every president since Abraham Lincoln has lain in state prior to their burial — was adjusted. Along with several other people, I carried the casket 10 feet each way. We once again guarded the president’s casket for the remainder of the day and through the night. The remainder of the services were executed to perfection and we eventually returned to D.C., emotionally and physically exhausted. As I sat and watched President George H.W. Bush’s memorial services on television over the last several days, I couldn’t help but think about the greater picture I had missed those 13 years ago. Ever since Lincoln’s funeral train, presidential funerals have pushed partisan differences aside. History becomes kinder to those who were brave enough to lead the nation that so many of us criticize, but would never do ourselves. I am proud of the men and women of the military in those elite units from Washington who have completed their missions flawlessly and given President H.W. Bush the respect and honor he deserves.